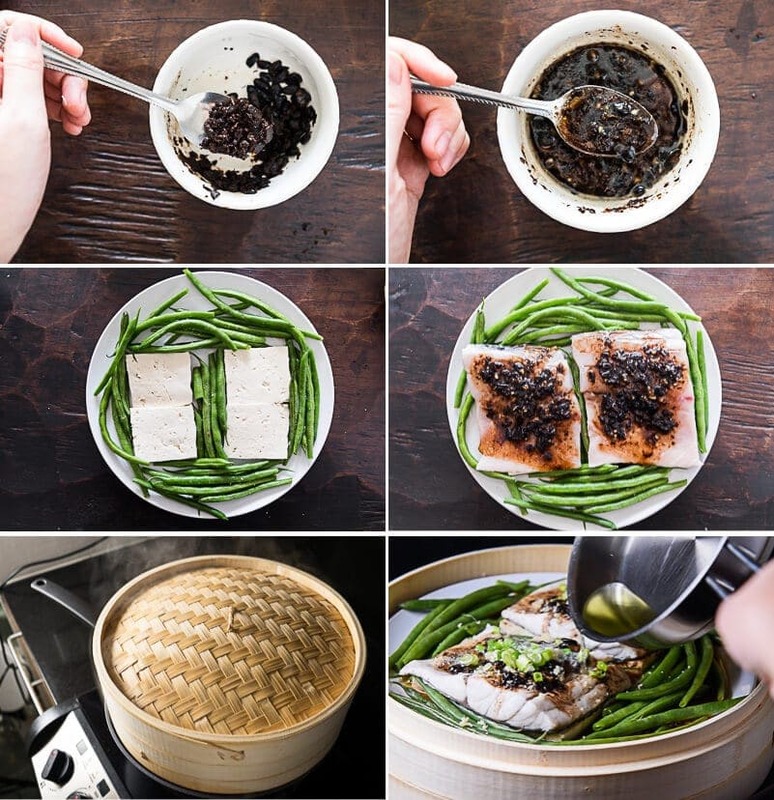 No matter whether you want to learn the authentic Chinese way to make steamed fish or just want to spend a few minutes getting dinner ready, I’ve got you covered! Steamed whole fish is a must-have dish on the table for celebrating Chinese New Year. It is also a dish we often order in restaurants when we’re celebrating or entertaining a business partner. In China we’d always buy a young live whole fish to use for this dish. The fish is cleaned, steamed with a soy sauce based seasoning and tons of herbs until just cooked through, and then seared with boiling oil poured on top. 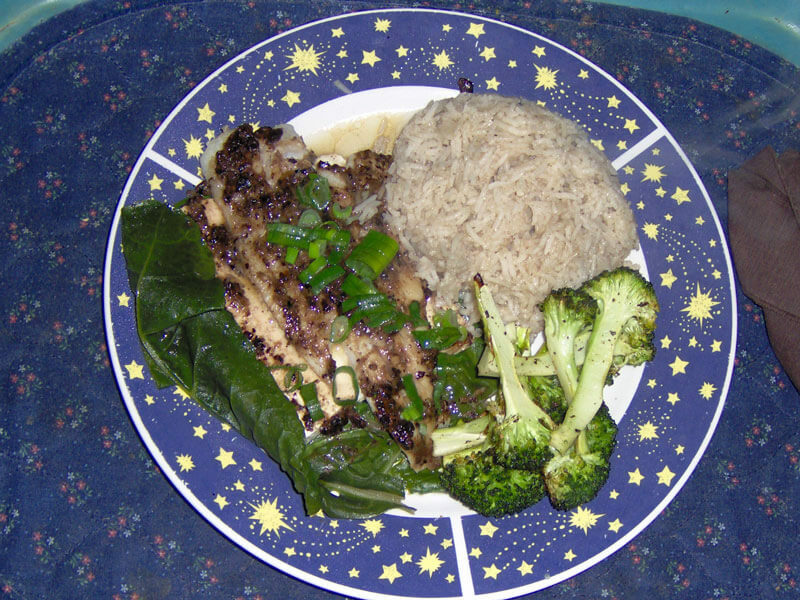 The cooked fish is flaky, tender, juicy, and the meat holds up well. It’s extra fragrant and buttery, almost like crab meat. After moving to the US, I’ve rarely had the luxury of cooking with live fish. Sometimes, even if we got live sea fish after fishing, it was usually too large and wouldn’t be suitable for this dish. Just like I always do – I changed up the recipe and make a version that is more practical for the average household by using fish fillet. The result was fantastic. 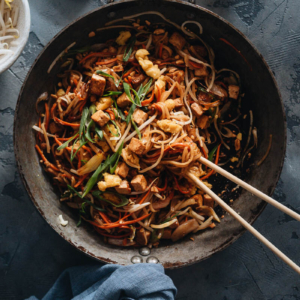 This recipe is a part of my stir-fry sauce series, to demonstrate how to make Chinese sauces ahead of time and use them in various ways to make your dinner preparations easier. 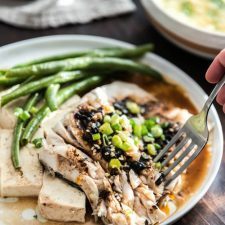 I want to use this recipe to show you that not only can you use black bean sauce to make stir fry, you can also use it to steam or bake a dish as well. 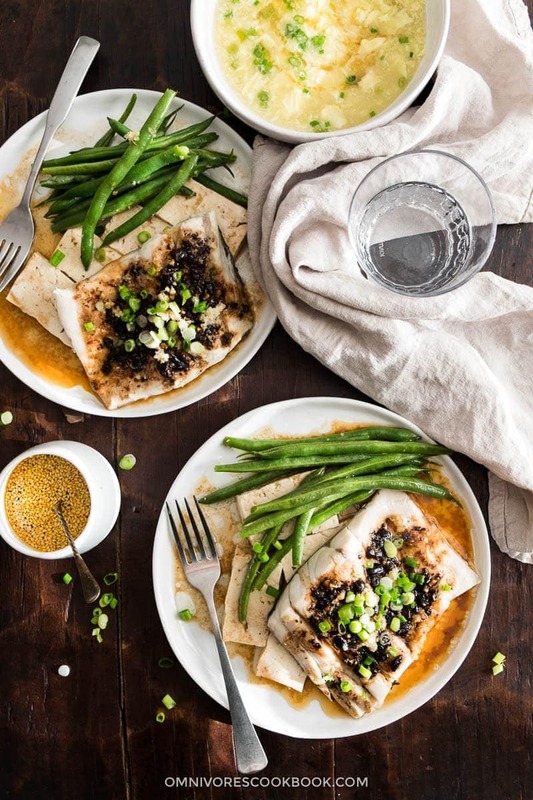 If you didn’t make the black bean sauce bulk version, no worries. I’ve included the method below so you can whisk the sauce together in 5 minutes. I stuck to the authentic method for the steamed version. If you read carefully, you will find that unlike my pre-made black bean sauce, you don’t need to pre-cook the sauce in this instance. But, once the fish is finished steaming, you need to spread a lot of aromatics on the fish, heat a few spoonfuls of oil until boiling, and then pour the hot oil over the fish. The sizzling oil will cook the herbs, sear the surface of the fish, and make it extra fragrant. Pouring hot oil might sound scary, but if you use a very light and small sauce pan, it will be quite easy to accomplish. 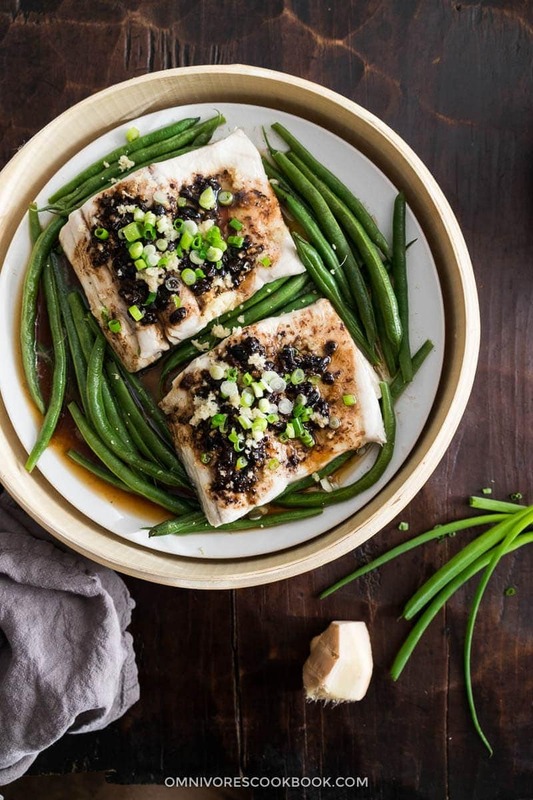 To make the dinner prep a bit easier, I added tofu and green beans to cook together with the fish. 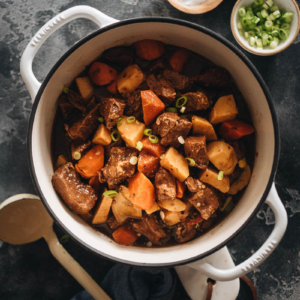 Everything will cook through at the same time This is one of my favorite ways to make a hearty and healthy paleo dinner without serving rice. To steam fish, you can either use a steamer or a normal pot with a steam rack. Either way, make sure that your plate is lifted high enough, so the boiling water won’t dilute the sauce. Compared to the baked version below, steamed fish will be a bit more juicy. However, it will be challenging to cook the meal for a family that has more than two people. 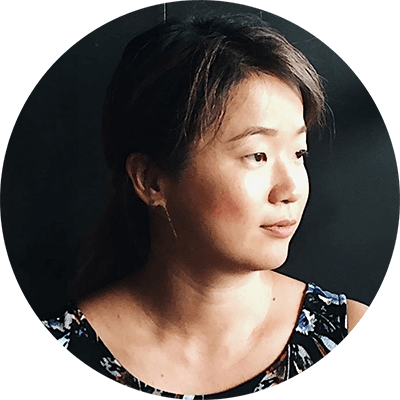 Unless you have a multilayer steamer or a giant skillet that is deep enough, you’re unlikely to cook more than two pieces of fillets at the same time. Also, because you will need to use a large plate to hold all the ingredients, I found it a bit challenging to remove the hot plate from the steamer right after cooking. 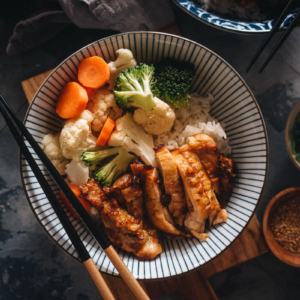 If you come across this problem, remove the steamer off the stove, (and remove the steam rack from the pot if you can), then transfer the fish and the sides onto a serving plate without lifting the hot plate from the steamer. To make this recipe better suited for a bigger family, I also developed a recipe for a baked version. I LOVED this method once I tried it out. The fish will turn out slightly less juicy than the steamed version, but the meat remains very tender and flavorful. The best part is, the prep takes 5 minutes and you can still cook a side dish in the oven at the same time. Dinner will be ready in 15 minutes. When I make the baked version, I did use my pre-cooked black bean sauce instead of the raw black bean mixture. The pre-cooked sauce is more fragrant, so I found out that I don’t have to pour hot oil over the fish to make it taste great. For a side dish, you can use sliced zucchini or green beans. They will be cooked at the same time with the fish. Of course, if your oven has enough space, you can bake more vegetables in a separate baking dish, so it will easier to control the cooking time and doneness. 2 large pieces white fish fillets sea bass, cod, catfish, trout, etc. To prepare the steamer, bring a large pot of water to a boil. Rinse fermented black beans with tap water, drain, and transfer to a bowl. Use the back of a spoon to smash the beans. Add garlic, Shaoxing wine, light soy sauce, and sugar. Mix well. Or you can skip this step by using pre-made black bean sauce. Choose a plate that is big enough to hold all the fish fillets, can fit in your steamer, and has a bit depth so the juice from steaming won’t spill to the pot. Spread the tofu in the center, and spread green beans around the tofu without too much overlapping. 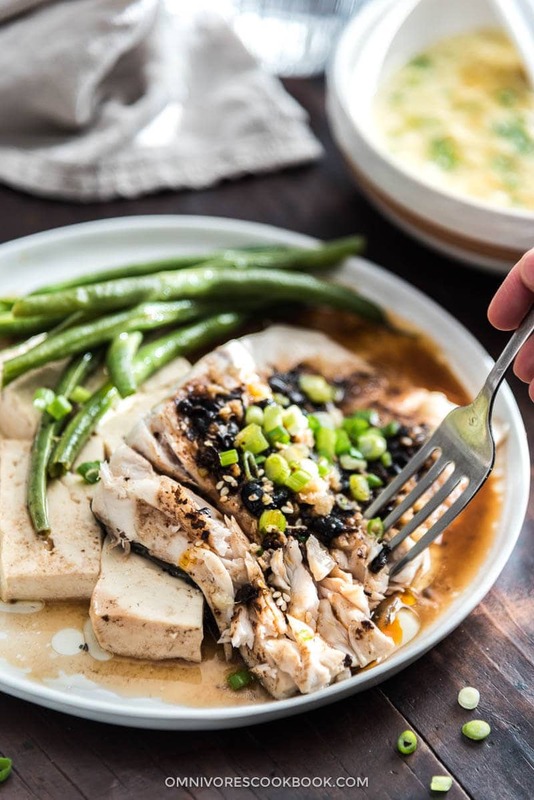 Lightly sprinkle salt over the green beans and the tofu. Arrange the fish fillets on top of the tofu. 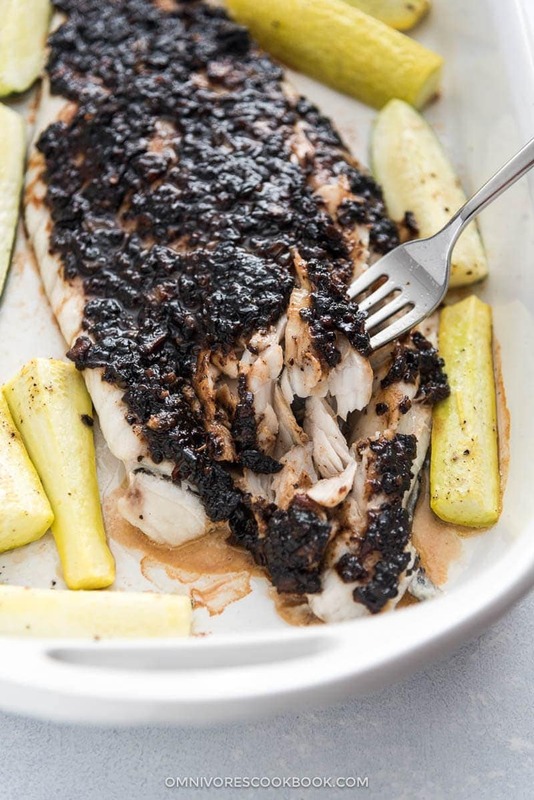 Spread the black bean sauce evenly over the fish. Place the plate into the steamer with boiling water. Steam covered for 8 minutes, or until the fish is cooked through. Carefully transfer the plate onto the kitchen counter with your oven mitts on. If the plate is difficult to lift from the steamer, leave it there. Spread the ginger and and green onions onto the fish. Heat vegetable oil in a small saucepan until it just starts to smoke. Immediately pour the oil onto the fish fillets to cook the green onions and ginger. You should hear a vibrant sizzle. Transfer the fish, tofu, and green beans to serving plate, pour the remaining juice over. 4 pieces white fish fillets or 1 whole fillet sea bass, cod, catfish, trout, etc. Preheat oven to 450 F (230 C). Grease a large baking dish with a thin layer of oil. (Optional) Halve zucchini crosswise and quartered lengthwise. Or, trim the tough ends from green beans if using. Transfer into a big bowl. Toss with 1 tablespoon oil and sprinkle with salt and black pepper. Place the fish fillet onto the baking dish, skin side down. If using whole fillet, tuck the very thin part (belly or tail) underneath to prevent overcooking. See the process picture in the blog post as an example. Spread the black bean sauce on top to cover the surface as much as possible. Arrange vegetables around without overlapping or covering the fish. Bake until the fish is just cooked through and flakes easily when lifting the thick part of the fillet with a fork, 10 to 20 minutes. My 1-inch thick whole sea bass fillet finished cooking in 15 minutes. 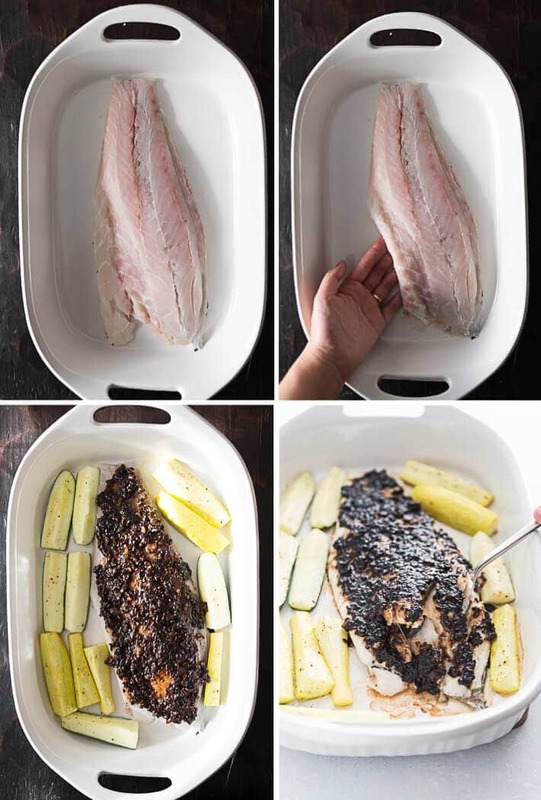 If the fish cooks faster than the vegetables, transfer the fish to a serving plate and return the baking dish back to the oven. Bake until the vegetables are cooked through. Serve immediately as main and vegetables as a side. The amount of oil depends on whether you will bake vegetables with the fish. Robert made Black Bean Cod on tofu & chard with extra roasted broccoli. So yummy and healthy! I made the steamed version tonight and it was so good! I substituted broccoli for the green beans because I already had them but, besides that, I followed the recipe exactly. My steamer is small so I had to split the ingredients into two bowls and steam them separately. Thank you for another delicious recipe, Maggie! Hi Giselle, thanks for leaving a comment and I’m glad to hear you enjoy the dish! I love cooking fish with the black bean sauce too. It’s so flavorful isn’t it? Hope you have a delicious week ahead Giselle!